LAWRENCE – The Center for Russian, East European & Eurasian Studies (CREES) and the Environmental Studies Program at University of Kansas have organized a special lecture to mark the 30th anniversary of the Chernobyl nuclear accident. Adrian Ivakhiv, professor of environmental thought and culture at the Rubenstein School of Environment and Natural Resources, University of Vermont, will give a talk entitled “30 Years (or 30,000): Seven Spectral Stories of Chernobyl,” at 7 p.m. Thursday, April 28, in the Malott Room of the Kansas Union. The lecture is free and open to the public. The talk will interpret the Chernobyl nuclear accident of 1986 within a series of widely varying spatio-temporal reference frames, including histories of the Soviet Union, its growth and eventual collapse; relations between Ukraine, Ukrainians and their neighbors; militarized “black sites” and Cold War (and post-Cold War) conspiracy theories; nuclear power and the anti-nuclear movement; scientific experiments on biotic populations; zombie and “stalker” cultures and subcultures; and the Anthropocene and its theorization. Ivakhiv's research and teaching are focused at the intersections of ecology, culture, identity, religion, media, philosophy and the creative arts. He is the author of “Claiming Sacred Ground: Pilgrims and Politics at Glastonbury and Sedona” (Indiana University Press, 2001) and “Ecologies of the Moving Image: Cinema, Affect, and Nature” (Wilfrid Laurier University Press, 2013), an executive editor of the Encyclopedia of Religion and Nature, a former president of the Environmental Studies Association of Canada and on the editorial boards of several journals including “Journal for the Study of Religion, Nature, and Culture,” “Green Letters,” “The Journal of Ecocriticism” and two book series in the environmental humanities. 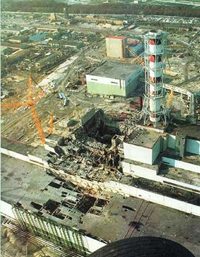 The Chernobyl nuclear accident, which occurred in 1986, remains the worst nuclear disaster in history, in terms of lives lost and the total number of people exposed to dangerously high radiation doses.